The League of Augsburg was the alliance of nations that formed to oppose the Sun King, Louix XIV of France,at the end of the 17th Century. Also known as the Nine Years War or The War of Two Kings (refering to events in Ireland.) This is a facinating period where the old tactics of pike and shot were transforming into the linear warfare that would be dominated by the musket firing infantry and artillery for over a century. 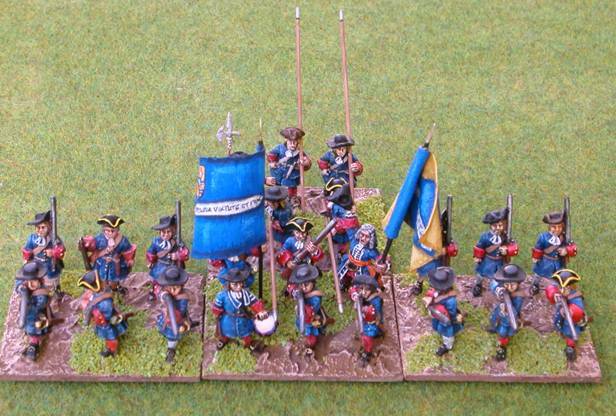 25mm Foundry and Dixon Miniatures based for Piquet: Cartouche or Beneath the Lily Banners rulesets. Here is a page with the initial batch of units Adam has painted up for this period, hopefully updates new figures will appear here when this project gets more attention. After action report of a game of "Beneath the Lily Banners" using what we had initially painted (click here ). Although this was an enjoyable game which could have gone either way until the last throw of the dice, there were some aspects of the rules we found unconvincing. Maybe version 2 of the rules (out now) will be more to our tastes. If not we will probably stick with Piquet for this period. Here is a second batch of regiments painted up for the period.